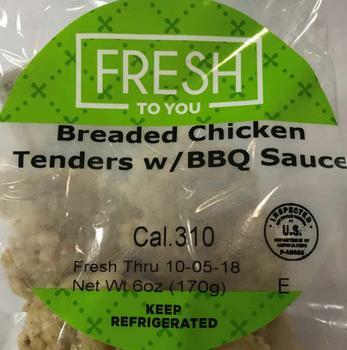 Canteen/Convenco of Middletown, Pa., is recalling approximately 1,778 pounds of ready-to-eat breaded chicken tenders. The products may contain milk (whey), an allergen not declared on the label. The recalled products, bearing establishment number “P-40088” inside the USDA mark of inspection, were shipped to retail stores -- specifically vending machines -- in Maryland, New Jersey, New York and Pennsylvania. Customers who purchased the recalled products should not consume them. Consumers with questions about the recall may contact Ann Sheridan at (704) 328-4056.